In the last decades, the social responsibility of business has been a growing source of mobilization by public and private actors and debate among scholars. The objective of this analysis is twofold. First, it aims at complementing the literature on the economic and institutional determinants of companies’ commitment on this issue. To this purpose, we place a special emphasis on the institutional factors related to labour relations. 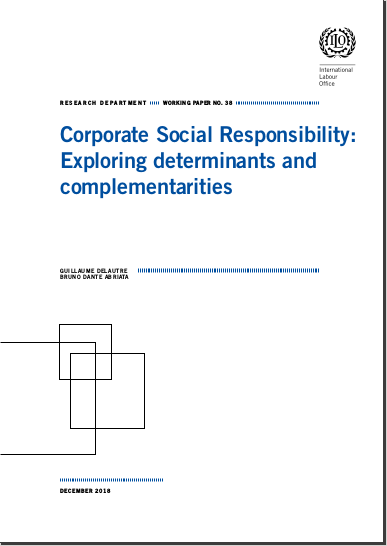 Second, this article also analyses the diversity of firms’ policies through the lens of potential complementarity/substitutability between the different dimensions of CSR and the possible trade-offs between the various stakeholders. We argue that even if firms’ behaviours depend on their economic characteristics, institutions (especially those related labour relations) play an important role in its shaping. Besides, our results support the idea that CSR should be seen as a complement to strong social regulations. Additionally, our findings suggest that freedom of association and corporate governance might have a crosscutting positive influence on other dimensions of CSR. Regarding the effect on the firm's economic performance, we provide evidence that CSR dimensions related to internal employees have a positive effect, but we find little evidence about different dimensions complementing or substituting each other in this sense.